Microsoft considered delaying some Xbox One launch games and even holding Halo 4 for their new console before committing to last week's unusually diverse and rich day-one Xbox One line-up, the company's head of game development told Kotaku. And now Microsoft is planning to give early adopters a lot more to play—earlier than they did on the Xbox 360. "It's worth pointing out on the 360 we did have a drought," Microsoft Studios chief Phil Spencer told me last week during a phone interview. "We had our three launch games and a couple games in Japan and then there were some third parties with Fight Night and others that saved us in having great games in the [first half of the first year] of 360." This time will be different, Spencer said, pointing not just to heavyweight platform exclusive Titanfall from Respawn Entertainment and EA in March. There's also the delayed former launch game Kinect Sports Rivals, Capy's Below, Swery65's D4 and Press Play's Max and the Cursed Brotherhood. "Even before the end of the year, we have Halo Spartan Assault," Spencer said. "Project Spark is coming." If those games can hit as soon as Spencer hopes they can, it'll validate a decision Microsoft made to not shrink their launch line-up. They'd considered it. "We had a discussion about whether we should hold some of the content, because we have 22 [first and third-party] games at launch. Is that too many games? But we looked at the genres the games were in, the ESRB ratings the games fell in and felt we had—from Powerstar Golf to Zoo Tycoon through Ryse and Forza—I thought the diversity we had was strong. I want the console used as much as it can be used, from launch on." Often it's Sony and Nintendo that churn out games, publishing exclusives for their platforms month after month. Microsoft had relied more on third parties releasing games on their machines. Hearing it all laid out from Spencer, it sounds like Microsoft as a games publisher is committing to a bigger output. "We haven't announced dates for all of the things we talked about a E3," he pointed out. "Some of that is we want to be solid on what the date is. So, [we're] spending a lot of time playing things like [Insomniac's] Sunset Overdrive and [Remedy's] Quantum Break, and down at [Halo studio] 343. But we will have more announcements of things that are coming in 2014. I feel really good about the line-up in 2014. People will have new content coming every month, whether it's digital, retail or something new to play. 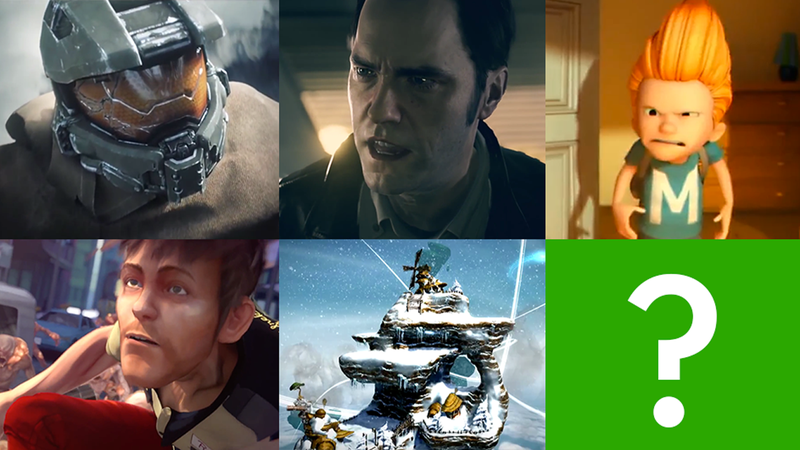 I don't think the line-up has ever been stronger for us on Xbox, and that's something great to say when you have a new console." Last year, Xbox 360 owners got to play the first Halo not made by Bungie Studios, the well-received Halo 4 from Microsoft's new 343 Studios. That wasn't always the plan. "A couple of years ago we had the discussion of: 'Should we do Halo at launch and not do Halo 4 last year?'" Spencer recalled, "But I was committed to getting Halo 4 done last year, and there was no way we were going to turn around with 343 a full Halo game in a year. So that was the plan we set on. I feel good about that." The Xbox One will soon get a port of Halo: Spartan Assault, the top-down action game released earlier this year for Windows 8 and Surface tablets. But that's not a big Halo game. It's not the huge new Halo teased at E3. "Unlike some franchises that manage through 1,000 people, Halo is 343 and that team obviously has tight control," Spencer said. "They are our Halo team. A discussion around having a Halo game at launch—a true Halo at launch, meaning like a Halo 4 or 5-size game—would have been something we'd have had to start two or three years ago. We had the discussion, and we thought having Halo 4 come out when it came out from 343 and having them really land their first full version of Halo that they developed internally would be great for the 360 customers, great for 343 in shipping something." The Xbox One isn't backwards compatible to the Xbox 360, but a game like Halo 4 seems like it could have life on the Xbox One. Spencer said that doing a port wasn't something he wanted for launch. "I want launch to be about new things that are taking full advantage of the hardware, especially as a first party. Any kind of strategy with the back catalog was something I thought we would think about later." Spencer: "A discussion around having a Halo game at launch—a true Halo at launch, meaning like a Halo 4 or 5-size game—would have been something we'd have had to start two or three years ago." I wondered how hard it even is to do a port of an Xbox 360 game to Xbox One. "It's not difficult," Spencer said, pointing out that Microsoft was developing some cross-platform expertise by making games like the new Zoo Tycoon and next year's Max and the Cursed Brotherhood for both Xbox One and Xbox 360. "Whether that's a port or just dual development, you get a sense of what it means to move games between the two platforms," Spencer said. "It's not just 'recompile,' but obviously our controller is very similar, we know our codebase, we're on a certain number of engines that we're porting in different directions, so it's definitely possible to do things like that." The first year of the Xbox 360 was the prelude to the release of the Microsoft-published, Epic-developed Gears of War. The third-person cover-based shooter co-starring Marcus Fenix and his chainsaw gun was one of the most influential games of the generation. The Xbox 360 had four Gears games. The most recent one, Gears of War Judgment, came out in early 2013. From the outside, it's hard to tell where Gears is going. Other Xbox 360 franchises published by Microsoft but not developed by Microsoft, such as Mass Effect and, to an extent, Dead Rising, have since gone multi-platform. Gears had not. Epic, the company behind Gears, has changed significantly. Top people behind the franchise have departed in the last year and Epic seems to be emphasizing other projects, such as the successful mobile series Infinity Blade. Epic also continues to sell the Unreal game engine. That first Gears had been a showcase for Unreal Engine 3, which went on to be used across the Xbox 360 and PS3 platforms by publishers like EA and Ubisoft. Those publishers, in this new generation, have moved more and more toward using their own in-house graphics engines. I asked Spencer what was next for Gears and if he could provide any assurances that the series would remain exclusive to Xbox. He gave a little laugh. "It's Epic's franchise," he said. "You and I both know that. I can't make any assurances about anybody else's franchise." He deferred to Epic on the question on the state of Gears. I asked Epic what was next and if Gears would still be Xbox-only. They declined to comment. Spencer: "I'd say, yes, there's nothing even pending that I'm holding to announce [about any new Gears of War]." "I'm a huge fan of the franchise," Spencer told me. "I want to continue to work with Gears. I think there's a lot of life left in that franchise. We had an internal discussion on it even yesterday. It's something that's active in discussion about what we can do with Gears. Obviously, I know [Epic's management] Tim Sweeney, Mark Rein, Jay Wilbur incredibly well, so nothing to announce yet and I'd say, yes, there's nothing even pending that I'm holding to announce, but I understand the importance of the franchise to the Xbox platform and to gamers—I'd say gamers first. It'd be great to do something forward with that franchise. "It's Epic's game and we have to talk to them about a partnership and what they want to do. As you know, you probably know right now they're more focused on other areas of their business right now." The Xbox has never been big in Japan, at least not among gamers. Japanese game creators, however, continue to support the machine. That's even been clear at launch, with Groundling and Yukio Futatsugi's Crimson Dragon and the Capcom-backed (albeit Vancouver-made) Dead Rising 3. Microsoft says they're hungry to work with Japanese creators. "I've been a big fan of our partnerships in Japan," Spencer said. "Futatsugi just finished Crimson Dragon, and I'm proud of what he was able to do. We're talking to him about what we might want to do next with him. There's some interest out there in some older [intellectual property]. Phantom Dust has come up around whether we would want to reboot that franchise. It's a discussion right now; there's nothing's signed. But we're talking. It does seem like there's a lot of interest around that. And we have a good long relationship with him and I think that would be good." Spencer: "Phantom Dust has come up around whether we would want to reboot that franchise. It's a discussion right now; there's nothing's signed." Phantom Dust was a Futatsugi-directed game for the original Xbox. The Xbox game offered an unusual combination of deck-building strategy and third-person psionic arena battles. Our own Mike Fahey says it's fantastic. "We have signed some things in Japan that we haven't announced that we'll announce in... '14 so that people get to hear about support in Japan," Spencer said. He teased that these would be seen as "full Japanese games," bigger than download titles. "The creative teams in Japan have always been top notch. And yeah, you're right that we've never been the top console in Japan, but the support that we've received, either from publishers like with Capcom and Dead Rising or developers is always great. We kicked off our independent developer program when were at Tokyo Game Show and saw some top talent walk through the door, so I think you'll see some indies too ... I'm committed to the development there." In the lead-up to the release of the Xbox One and the rival PlayStation 4, gamers and the gaming press began comparing the graphical prowess of both machines. The might of both machines is hard to assess at launch, given that the capabilities of game consoles are never tapped fully for years. But Kotaku sources and others have given the PS4 an edge due to the Sony console's better graphics chip and faster memory. "The Xbox One architecture is much more complex than any specific feature or component. The proof is ultimately in what gamers see and experience, and with the diversity and quality of games we have at launch—games like Ryse: Son of Rome and Forza Motorsport 5—we are delivering experiences that demonstrate the power capable only on Xbox One. This is only the beginning, as creators spend more time with our development tools and tap the power of cloud compute, we're confident that the Xbox One will be home to the best games, now and for years to come." Earlier, over the phone, we'd spoken about the performance of Xbox One games, mindful of some controversy over some cross-platform games running in a higher 1080p resolution on PS4 than on Xbox One—and also mindful of how good some Xbox One games look in varying resolutions. I'd wanted to know what Microsoft's priorities were for Xbox One game graphics. "In the design process of a game... any game, you're thinking about fidelity of input, how responsive input is, which is really a framerate question, obviously, more than a frame size question," Spencer said. "If you think about a fighting game or you think about a racing game, 60 frames per second for your precision games is something you're going to target, which is obviously going to have some impact on the resolution and density of scene that you're going to build, just because you're flipping frames twice as quickly. "The other thing is that, when you get real high-contrast outdoor environments with a lot of foliage and other things, you start to look at strong lighting and anti-aliasing techniques that you want to put in place, which, again, is a trade-off against framerate, and scene density and scene resolution. "To me, it's always been about putting the controls in the hands of the creators and the developers and the artists to pull the right levers to get to what they think is the right experience for gameplay and visuals. To try to turn it into a math exercise of: 'If it's not this framerate or it's not this resolution then it's somehow not a valid game or it's less of a game' I think is an issue.'" For the record, Spencer said that both the Xbox One launch racing game Forza Motorsport 5 and the launch fighting games Killer Instinct run at 60 frames per second. Ryse runs at 30 frames per second and natively at a 900p resolution. Ryse has proven to be a stunning looking game, regardless of not running natively at 1080p. Spencer: "We actually ran the game at 720p, 900p and 1080p and looked at the different lighting techniques, all at 30 and said. 'Ok, where do we think the game looks the best with everything we're able to turn on?'" "We actually ran the game at 720p, 900p and 1080p and looked at the different lighting techniques, all at 30 and said. 'Ok, where do we think the game looks the best with everything we're able to turn on?' 900p is where the game landed," Spencer said. "It didn't look better given all the techniques given all the techniques we were going to employ." Spencer didn't seem worried about resolution and sounds more committed to framerate stability and not letting things get too choppy. "We don't really entertain anything below 30 [frames per second]," he said. "We see that as a bug and something we need to fix. Things like screen-tearing, I think, are bugs, when the framerate is out of sync... those kinds of anomalies break the immersion for people. The nice thing about playing a great game with great visuals is that you can kind of lose yourself in the scene. And, when things that happen that are anomalous to that, I think it pulls people out. So we're always looking to stomp those out." One striking element of the Xbox One's launch line-up so far is that most of the games offer some way to pay real money to buy extra items or get more chances to get cool new stuff. There's been some uproar over this, though the strategies used from game to game vary so much—from paying for characters to bolster the "free" Killer Instinct to paying for better cars in Forza 5 to having completely ignorable micropayment options in Ryse—that it seems like Microsoft doesn't have a fixed strategy for adding microtransactions to their games. That'd be correct. "We're still learning," Spencer said. And if fans don't like a micropayment? Don't buy it. Spencer said that he's making sure that all of the Xbox One game include feedback mechanisms that allow Microsoft to closely track what gamers buy. "I want to be able to learn from what we put in," he said. "So let's make sure we are crafting the game and the analytics so we can see what the consumers—the gamers—like and don't—if you assume buying habits are a reflection of what people like. So that we can craft the experience better for the gamer." Spencer: I guess I have that line, that [we wouldn't have] "Pay five bucks and get 1000 achievements" or something stupid like that.' I'm always pushing against that." Maybe it's not the end of the world if there are microtransactions in a single-player game, just as long as it's easy enough to progress in the game without paying extra. Microstansactions in multiplayer games can tip game balance, if you can buy things that make one player more capable than another. Spencer is aware of a need to have some limits, but doesn't yet draw many lines. "It's easy to say something like, 'I'll never allow somebody to buy the win of the game, I won't let them buy victory,' but that's kind of a trite answer. I'd say, 'Yeah, I guess I have that line, that [we wouldn't have] "Pay five bucks and get 1000 achievements" or something stupid like that.' I'm always pushing against that. But, in reality, that's not what the gamers are looking for. They're usually looking for customization and their gameplay style opening up." Bottom line: there's lots to come on Xbox One and lots of experimentation happening along the way. While Sony has continued to push PS3 game development throughout the year, Microsoft has largely shifted from Xbox 360 to Xbox One. Spencer's plans and the games he discussed with me are part of that. There's more, too, from Peggle 2 next month to an Xbox One version of Minecraft. We'll keep you posted, of course.